With great pleasure we present you the first Organic chocolate of Greek production. The high quality raw material, our desire and our skills in the sector of chocolate production have achieved for you a high quality organic product. We select the different cacao varieties from the countries of Central America (Ecuador) and Dominican Republic. All the raw material is organic cultivated with no pesticides or chemical fertilizers. 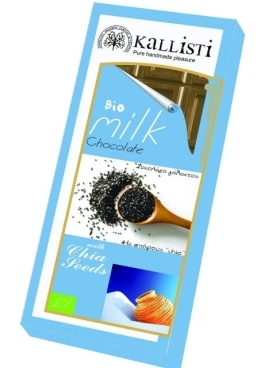 The organic chocolate «Koxyli» does not contain lecithin or chemical preservatives that can harm our organism. 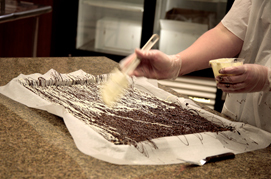 The Cocoa solid concision is 34% for the milk chocolate and 70% for the dark chocolate. Its spending advantage also is, that contains 100% Cocoa butter and no others oleaginous (vegetable fat). The organic chocolate recipe is ideally combined with the vanilla aroma (Bourbon), the raw cane sugar and the entire roasted almonds. We are using modern mechanical equipment and we are verified and certified for all our organic products from the certification organization «Qways». A.E (quality ways). The company retains and secures the high quality of the product applying the ISO 22000 system (International Organization for Standardization). KOHILI company is a family chocolate workshop in the village of Loutraki in Korinthos. Martha and Panagiotis left Athens in 1993 to dedicate themselves to traditional chocolate recipes researching and testing until the outcome was satisfying, they made the first handmade, organic chocolate in Greece. Since then, they have been introducing mastiha – the unique traditional Greek sweet -, Goji Berries and almonds into chocolate. Moreover, HACCP and ISO 22000 standards for food safety are applied through the entire process. In 2006 the family was nominated the Greek Innovation Award in recognition of their work.